Healthy hair starts on the inside. What you eat plays a big role in how your hair looks and feels. The foods you eat can either give you the nourishment you need to rock a beautiful head of curls or it can zap your strands of nutrients leaving hair dull, dry, and lifeless. So, what are the best superfoods for hair? Here are the top 5 hair superfoods you should add to your diet ASAP. This one should come as no surprise. Lean, healthy fish is packed with tons of nutrients needed to keep hair healthy. It has fatty acids like omega 3, iron, and proteins needed to rebuild keratin in strands. Salmon also has hard to find vitamins such as B12 and D which help keep hair strong. It is suggested to eat salmon 2-3 times a week for good results. Eggs are a top performer for your hair and is another superfood known for its protein. Like salmon, eggs are a great source of high-quality protein needed to encourage new hair growth while keeping strands strong. When trying to reduce breakage, this is one of the best superfoods for hair thanks to the biotin and B vitamins. Scramble up one egg a day for healthy, shiny curls! One of the more surprising hair superfoods that has become a health craze is quinoa. It offers protein benefits for strong hair. It also offers the hard to find vitamin E. This is commonly used in hair care products for its moisturizing power and ability to restore balance to the scalp. While using vitamin E rich products is good for your hair, it really packs from the inside out when added to your diet. This food can be added to salads and soups, as well as baked breads. Looking to stop hair loss and encourage growth? This nut is packed with powerful properties to do just that. It has vitamin E and omega 3 fatty acids in high quantities to help hair retain its keratin for stronger strands. Almonds also keep your strands moisturized and shiny. Still need more reasons to snack on these bite-sized powerhouses? They are loaded with hard to find zinc that helps with circulation for a healthy scalp. 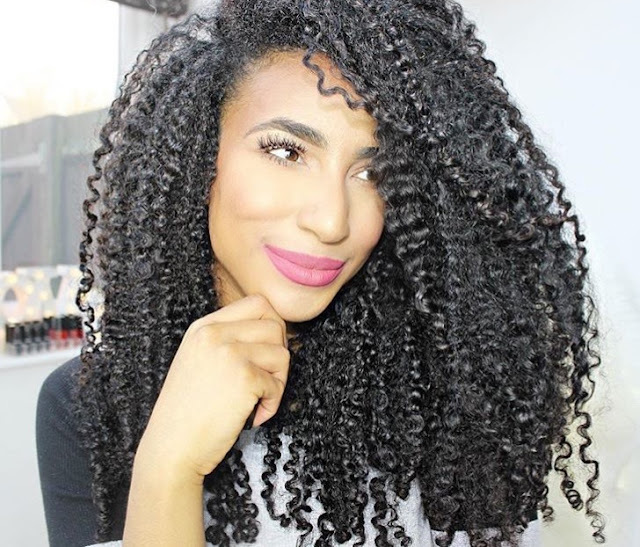 Your scalp is the foundation of a great head of curls. With all this talk of proteins and fatty acids, what about other important vitamins? Mangoes offer a good dose of vitamin C to make them a great addition to your next meal. Vitamin C gives you the nutrients needed to produce collagen which helps build hair structure. It can also help with iron absorption for those with iron deficiencies. Iron deficiencies can impact hair growth. It is important to remember that what you eat affects how you look. With the right superfoods, you can make sure your curls stay healthy and beautiful!